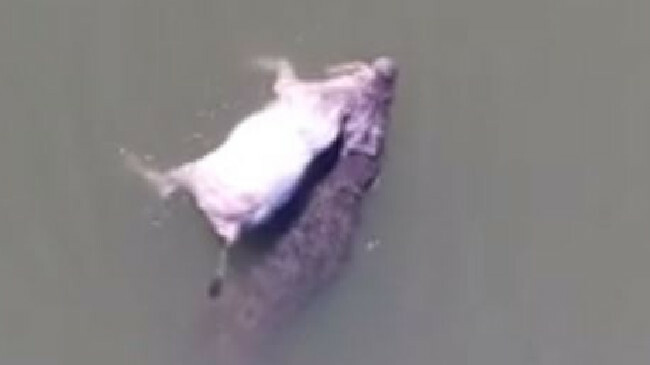 A drone video of a WA croc swimming with a cow in it's mouth has gone viral. A VIDEO of a huge crocodile spotted swimming in Western Australia with a cow in its mouth has gone viral, making headlines around the world. The croc was spotted in the Kimberley, WA by a group of barramundi fishermen on Friday. They had been on the water using a drone camera to film a promotional video and quickly turned their attention to the animal. "He's gotta be five, six metres this croc. He's massive," one of the fishermen can be heard saying," in the footage. "We actually saw it drag this cow off the bank a bit further up but we weren't quick enough with the camera to see it. 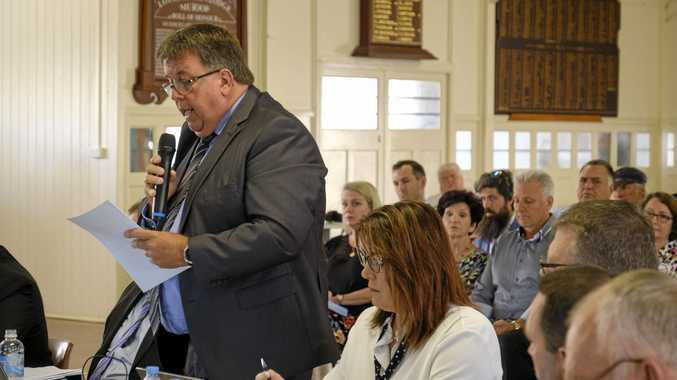 "That was probably a couple of kilometres away, so he's not giving it up in a hurry." Another fisherman can be heard chiming in: "you can see the bite marks in the top of the neck where the head used to be." 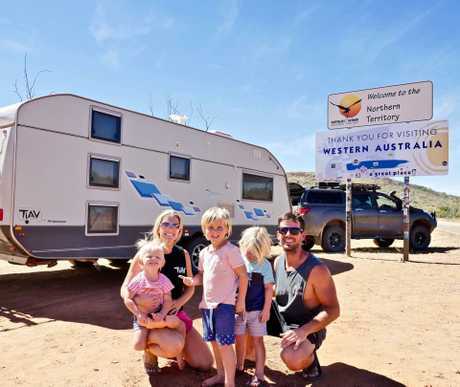 Justin Lorrimer, of Burpengary, who is travelling the country with his family in a caravan. The drone video was later shared on the family Facebook page of Queensland man Justin Lorrimer, of Burpengary, who is travelling the country with his family in a caravan. "Out for a days Barra fishing and we spot this HUGE CROCODILE dragging a cow down the river bank. We follow him with the drone as he swims down the river with his lunch," he wrote. "He eventually gets the (sh**s) with the drone buzzing around him and tries to pull the cow underwater. "An amazing display of how powerful these big creatures are!" The post was a clever bit of marketing by Mr Lorrimer who is documenting his family's adventures and was clearly designed to attract attention to his social media channels. But it certainly paid off. At the time of writing the Facebook video has been viewed more than half a million times and the images from the video have been picked up by media from around the world, including the UK's Telegraph, Daily Mail and Daily Star.